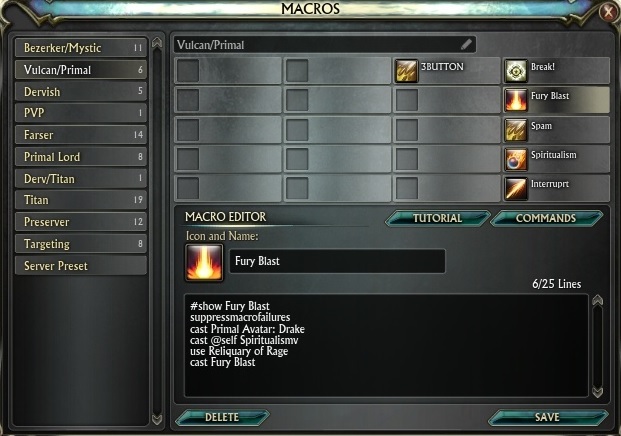 While this is a generally accepted technical definition, in Rift a macro is a list of simple commands that perform a task in the game by assigning it to an action bar. Multiple commands may be assigned to one button, even though only one command will be executed per button press. These commands include all of the commands that you can type automatically. For example if you were to to go to your chat window and type in /help it would give you a list of commands that you can also enter. If you were to create a macro and put this exact same command in and nothing else, you would get the same result in your window as if you were to type it manually. This effectively shows you what you can actually do with a macro. Anything that can manually type into your chat windows. Now you may think this isn’t very useful as you are use to having an ability bar and all these fancy interfaces that you communicate with rit through.What may (or perhaps will not) surprise you is you can accomplish all these same things through typing commands into your chat window. For example a low level warrior might drag an icon to their ability bar and click it to cast Shared Suffering and apply a buff to themselves. They can accomplish this exact same thing by typing the following. So if you think about it,essentially the ability bar and all the fancy graphics are a nice easy way for you not to have to remember hundreds of commands and not have to worry about spelling errors. Green (Left side): Here you will see Category 1-10 and a Server Preset. For now ignore Server Preset. Each of these categories are meant for organizing your macros into groups that are manageable and easy to find, edit and implement. They can be renamed to whatever you see fit (see red block) and each can contain up to 20 macros. Red (Top most block in middle): The name of the category. In the picture you will notice it says Category 1. If you click on Category 1 you can edit it to be whatever you want. You could name it chat commands, system, insults or even emotes. Making categories is completely up to you . Yellow (Below Category identifier) This is where your individual macros are stored. There are room for twenty macros here. More detail will explained later on this section. Blue: (Commands) Clicking this button rings up a list of commands that can be used in macros. This is useful in allowing you to get a description of each command. Magenta is the macro text itself. What many people do to simplify things is assign each category, 1-10, to either a specific role or soul. A Role, if you remember, is whatever build you are using in the game contains 3 different souls. For example a cleric healer may use the souls Warden, Sentinel and Purifier to make up one Role. This works well in cases where you have less than 10 roles for your character. All macros for that role will all be easily grouped. Many people will also place all primary soul roles into one category. Every class has about 11 different callings, so for each calling you can have one category. For example if you have a mage you can put all elementalist builds in one all warlock in another. This works great if you have several variants o one build. Below is an example of my primalist macro interface. As you can see I use a combination of the two with a section for targeting added in. You may be surprised at how much targeting and putting these in macros actually occurs in this game, and I find it helpful to separate the two. Because Break Free is unable to be cast at the moment, Rift goes to the next line and checks to see if the next spell is on cool down. Since it it is not, Fading Light is cast and the macro ends. You could type this over and over to each friend you met, but eventually this would get tiring. Instead of doing this, click on the system menu in your menu (bottom left of screen, what looks like a little computer) and go to macros. What you will see is your macro interface that you will be using. On the left there are a series of different categories, each that can be defined with a name. Let’s start out by choosing the top left one. In the right hand side you will see a line of text that reads Configuration 1. You can rename this to anything you like, and in this example I renamed it to simply say Chat. Now you can click on one of the macro slots below that and we can enter in a macro. 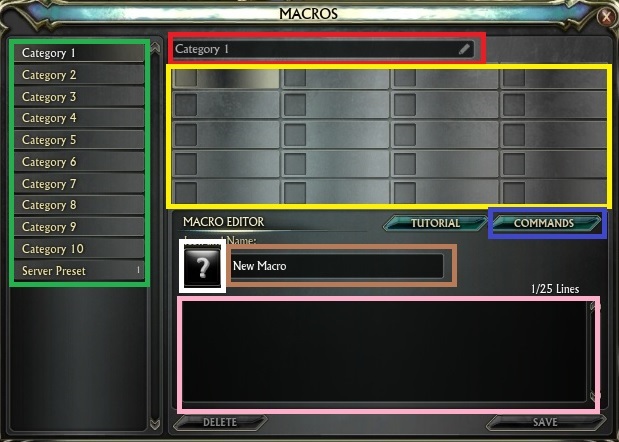 When you select a macro slot you will see the macro editor in the bottom of the screen. Where it says new macro, highlight and remove that and type in the name of your macro. For this example we’ll name it Hello. Below that is where the extra macro text goes, Up until this point we have just been labeling categories. In this the bottom part type exactly what you would in chat there, eg /“say” “Hello World”. There is one more thing that we have to do before we can save it, and that is choose an icon for that macro since we do not already have one to go off of. Left click the box to the left of of the macro name and choose an icon. Now you can save the macro. Drag the icon to an actin bar and press the icon with your mouse pointer and boom, it repeats your action with one button press! Rift saves the macros to the server when you log off of your character.in order to make sure you save any macros you create I highly suggest you manually log off your character as soon as you update your characters.Ending the program in the task manager a crash, or even a disconnect will cause you to lose your macros If the game itself crashes and you have not saved your macros, they will be gone. You will notice that after saving that the slash at the beginning of the line was removed. This is because of how text entries work in normal text entry. When Rift sees a slash at the beginning of a text line, it knows that it does not signify just conversation but literally a command. It therefore runs the command through a different internal part and runs whatever the command may be. So, what else can we put in here? Before we move on let’s look at two other parts of a macro that are standard usage before moving on. Below is a full macro, notice how there are two new lines. The first line contains a command called “#show”. What this does is replaces your icon you chose manually before with the icon that is used by the ability specified, in this example break free. The next line there is a command called suppressmacrofailures. I honestly have no idea if this works as it was supposed to when the game released, but even with this line in the macro errors still pop up constantly. I put it in most of mine just because of habit but it may one day actually be fully implemented. So you may ask yourself what commands can be used in macros? Obviously we have the used “say” command already, so we can use the rest of the normal chat commands as well as many others. Standard chat are below to the left. Along with the normal chat commands, you may have some commands where you need a pronoun, such as “Cleric gets mad at her:” meaning an npc. Now how do you know if this NPC is a man or women, which pronoun should be used. Rift gives us the commands for this. Targeting Once you start casting abilities you will want to be able to choose a number of different targets. These go beyond just the normal target you may think of, which would be your current target. What if you want to target the enemy and heal whoever it is attacking? What if you need to switch to the lasttarger you had because you accidently switched off. What if you are tanking and need to intercept the damage going to another member. The below targeting identifiers are to the rescue. @focustarget [name]: Cast a spell at a target of a focused target. @lasttarget [name]: Cast a spell on the last target before your current target. @targettarget [name]: Cast a spell on your target’s target. @pet [name]: Cast a spell on your primary pet. Macros aren’t very useful unless you can tell the game what you want to do. Do you want to say something? Do you want to use an item? Do you want to cast a spell? Here is a list of commands that start out a line in a macro by telling the game what to do. There are several commands which can be added to any macro to modify its behavior. As an example lets say we want to have a macro that has the ability to mark a target or select a marked target. In order to do this we can add a modifier to the macro that allows us to run the macro one way, in this example selecting mark 1, or if we also push the shift key at the same time as clicking the macro it will mark the current target number 1. Notice how the shift work is inside of the brackets like [shift]. This can be done with alt and control also in the next macro. Note in this macro the order is shift, control, and alt, or 1, 2, 3. After playing for a bit you will realize that many times you have different pieces of gear that you use for different roles. You may have a different synergy crystal for each of your builds. or a different focus for a tanking or healing build than you do for a dps build. You can manually equip each piece of gear every time you go onto one of these builds or you can use a handy macro command that built into Rift . saveequip # Saves a set of currently equip gear in the # slot of that you have. loadequip # loads a previously saved set of gear. Note: This is Version two of two entirely separate guides by the same authors. This is a good article, and already quite long and detailed. I would propose an additional article about what can and cannot be combined in a macro. For example, an instant cast will generally terminate the macro, and nothing after it will be used, *except* for range vs melee, ogcd skills &c.
I am enjoying your site. If Rift continues, I may volunteer to write a few of these myself. Very awesome and thank you for the support! i have to agree that these macros are easy to make, but explaining them sometimes, can be difficult. Perhaps i can go at that section again. i think I may have had more on it in the first version, but i would have to check it out! You are very correct sir, will be updated soon.